Estás navegando en la categoría GENERAL (previous). Dynatech has the pleasure of informing you that all their progressive safety gears are now certified according to the EN 81-1 + A3. With regards the governors, the STAR and VEGA models are also certified. The rest of the governors are still in the process of being certified. We expect to receive the corresponding certifications in the next few days. As soon as we receive them, they will be published on our website. Safety gears: Currently, the final official tests are being carried out in order to standardise the ASG-100 and ASG-100-UD safety gears for guide rail T65/54/8. We hope to have the certification before August. Governors: Among other innovations, a new governor called QUASAR will be presented at the Augsburg Fair, initialising its commercialization. This governor has a diameter of120mm being extraordinarily compact as a whole. Today tests are being carried out for its standardization in the official Laboratory in Madrid. In accordance with the design validation tests carried out previously at our installations, we hope that this governor will achieve a range of tripping speeds from 0.3m/s to + 3m/s. Its performance is not related to its size. The standardization will include the A3 from the start and we also hope to have this before August. Dynatech is glad to inform you that the certification process for its safety gear and governors has started in accordance with the Addendum 3 requirements now that the Notified Bodies have finally provided us with the procedure to follow. The operating and maintenance instructions for tension pulleys 200 and 300 have been modified. The operating and maintenance instructions for tension pulleys 200 and 300 have been modified in French, English, Spanish and German. Modifications in T-25 and T-25 UD manuals. We inform you that the new T-25 and T-25 UD operating and maintenance instructions are now available in our website. You can donwload it in the product section. Mistake on the news about the Lifts Directive 95/16/EC, Annex IX Certificate. We apologize for the mistake made on the bulletin about the Lifts Directive 95/16/EC, Annex IX Certificate. The current certificate has not to be renewed, it is valid until october 2009. Renewal of ISO 9001:2000 Certificate. 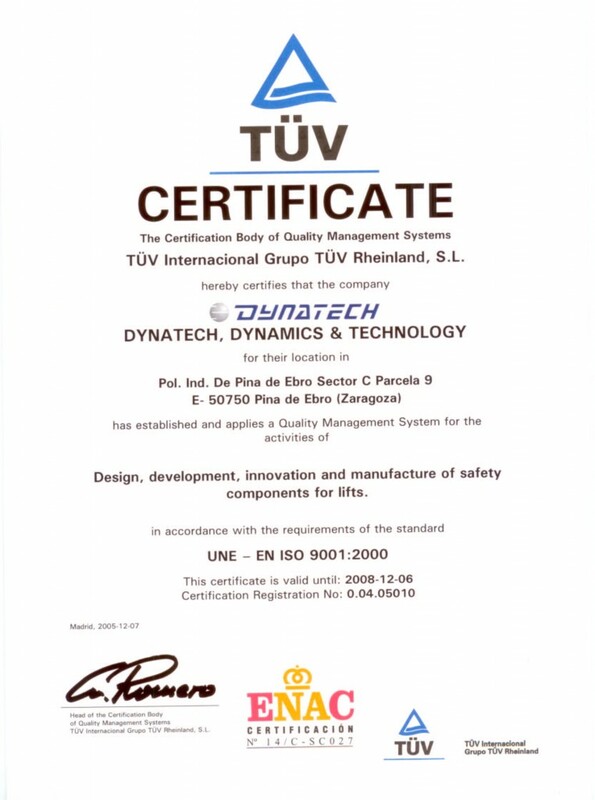 We are delighted to inform you that Dynatech has renewed the UNE – EN ISO 9001-2000 certificate issued by the accredited body Tüv. This new certificate is available in the following languages: Spanish, English, French and German. You can obtain a copy from this news section. Our Company has also successfully passed the audit of the Directive 95/16/EC – Annex IX.